Laurus is a wondeful book, on many levels. As literature, as philosophy, as a kind of pseduo-history and, yes, as theology too. Unfortunately, I suspect it will become a “cult classic” in the west, but it deserves to be read as a first class work of world literature. Thank you for these words, Father. I am about to read this book for the first time and very much look forward to it! Your words on confession are very helpful as well as I hope to take part in this sacrament in the future when my parish Father deems it time. It is something that has been on my mind quite a lot of late. Thanks again! Pray for me. Great review, Father. I just recently finished the book and an looking forward to reading it again. Thank you for making the distinction between toxic shame and shame that is normal. I’ve struggled with understanding the difference, but your words here have helped me to see more clearly. Wonderful insights Father, as always. Thank you. I remember my Dad, now long dead, saying to me when I was in high school, about a million years ago: You can fool other people, if you want to, but never be stupid enough to fool yourself. Sadly, I failed to take his advice–as I think is the case with most of us to some degree. As a result, confession is that much harder. Reading your text, Father, I remembered Roberto Benigni’s film, La vita e bella. I have not read the novel you mention here. I comment only because it made me think of some “events.” I know of someone who had the desire to be humble; who wanted to humiliate himself so that he would be more like the saints who empty themselves. Someone else told him once: be careful; pride may have taken a hold of your soul. It was the idea that he may have developed the belief that he can make himself a fool, that the source is in him. It is interesting how “being a fool” cannot be desired in itself; one is, or one is not. And when one is, the source is love–just like, Guido, in Benigni’s film (he is not a fool for God in the Russian way, but he is a fool for Love 🙂 ). And from what you mention about the novel, love seems to be the source there as well. I have to get the book :). It is perhaps one reason why Jesus calls us to bless those that curse us or despitefully use us or that we simply don’t like. It is often these people who reveal our selves to us. Is it not? How can we not thank God for that? The comparison with Hesse is interesting, Father. I’ve compared the novel with Garcia Marquez’s “100 Years of Solitude”, as something of an apologia pro patria sua as well as a critique of modernist conceptions of history… But I think Vodolazkhin answer’s Marquez’s despair with Resurrection. I’ll be recommending the novel for the rest of my life. I’m hoping to start re-reading it soon. We exchange one foolishness for another foolishness. (1 Corinthians 1). We die to one and are born to another. Thanks for your review, Father. I read “Laurus” several months ago and could relate it to an actual person. 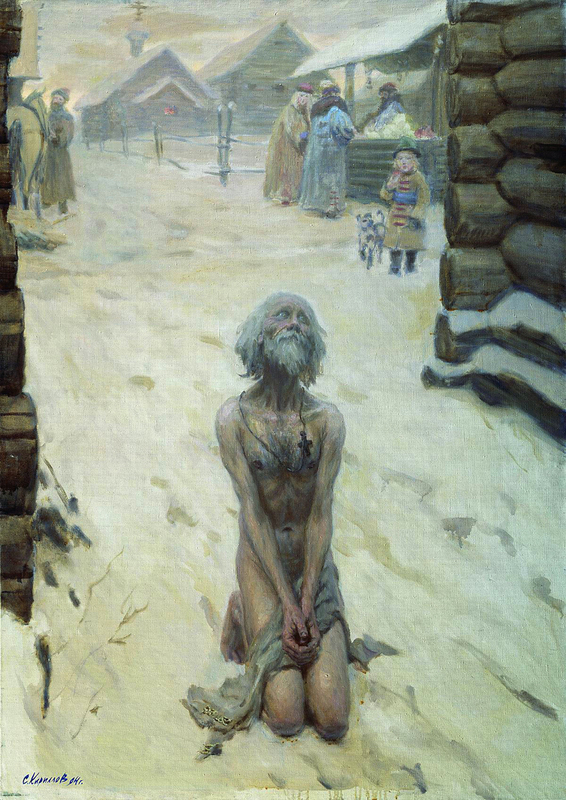 When I was young (in the 1950s) my Orthodox community had a “Holy Fool” who lived as a hermit and had the appearance of a Russian peasant (which he essentially was, despite having immigrated to the United States). His name was Andrew (Andrei) and he would just walk into people’s kitchens, start odd conversations, and then leave. Some persons were afraid of him and considered him unbalanced. Other persons gave him something to eat, and some older persons even asked for his blessing. My grandmother said he was a “Yurodivy” (which was what a Fool-for-Christ was called in Russian.) I thought he was interestingly awesome and never met a person like that again in my life, because he was, of course, out of place and time. Great, great novel. Lots of references to historical holy fools. Thank you for this analysis of Laurus. I read it recently and was troubled by the ending, which you have made more clear. I too like the book very much and am on my second reading. Interesting how many people re-read it. Your description and my curiosity about Laurus drove me to order the book. Thank you for the spiritual stimulation to think outside the box. Thank you Father. I’m sorry I missed your talk in California, as I was unable to drive up that day. “Being told that you are of no worth (or worse) can be among the most devastating moments in life. Shaming conversations tend to linger for years, even for a lifetime. But toxic shame has a striking characteristic: it is not voluntary. As such, it is an effort to emotionally control, even destroy another human being. It is demonic.” Yes, indeed. Thank you so much. It is often overlooked that Christ likened abusive name-calling to the prohibition of the statute against murder (Mt 5:21-22). Having experienced a good deal of this sort of shame in childhood, I found that very difficult public experiences of a sort of voluntary shame actually provided a harrowing but true way to un-do much of the damage done (of course, God led me to such a place). I came out of such an experience with a new and surprising (to me) experience of humility as healing “humiliation,” and also a more transcendent sense of self. Yes, this is true, and very hard to describe (or even suggest for others). It is so “voluntary” that God seems somewhat reluctant to “suggest” it to us. Of course, a Divine suggestion easily feels like a commandment, and thus it ceases to be voluntary. Instead I think that Christ “woo’s” us to share in his voluntary sacrifice and bearing of shame. Being vulnerable, we become invulnerable. Such a mystery. You should contact Amazon and request your commission! Recently you had commented on a post wherein the poster said he had just began to read “Beginning to Pray” and you noted it was probably the best book you had read on prayer. I just want to thank you as I just received at copy a couple of days ago, and have spent most of this night reading it. It is a wonderful and very helpful book on prayer. What is the proper attitude of thankfulness and “despairing not” as one walks the descending path of Christ? I can certainly be thankful that in His loving kindness He has not “had indignation against me.” I can be thankful for my daily bread provided by Him. However, it seems to me that the moment I am thankful for the descending path I may believe I’m on, I am no longer the Publican and I become the Pharisee. Was the character in this book able to “keep his mind in hell and despair not?” Is the lack of despair–the joy of Christ–a mystical outcome of keeping one’s mind in hell that one cannot will one’s self to have? How does one come to live in the tension of one’s mind in hell and yet despairing not? In my own life as I am occasionally aware of the ever-widening wake of pain I cause others and of my own wretchedness, and my inability to shed true tears of repentance in my shame, all I can see is the tragedy and experience the despair. What you describe is a very difficult point. We can, in fact, give thanks for all things at all times. But this is counter-intuitive and feels like such a contradiction. It is the recognition that God has not abandoned us, even in the depths of hell. See Psalm 139 “Even if I descend into hell, Thou art there.” There are times when it becomes clear to us that we and everything around us will only be saved by grace. And though we say such things easily as a matter of dogma, when we actually see it and feel it existentially, we can fall into despair. But what is happening is actually reaching the point of the gospel. In general we think, “A little grace will get me there.” The knowledge of our powerlessness, however, can be overwhelming when it is realized. And it is there at that point, that we most deeply need to begin giving thanks for all things. For God is the Lord and the Giver of Life. The giving of thanks at that point draws our attention away from ourselves (which would only keep us in despair). This is the “death to self” found in the Scriptures. God give you grace! Mike B. I understand your plight. It helps me to remember the times when I have felt the joy of Christ most have been in times of personal pain and loss—times when I was in or near despair. All of my own resources exhausted, or so it seemed. Thank you, Mike B, for your inquiry. And thank you, Father Stephen, for your response. Christmas and also strong desire to read again. The other parts of the equation, are that I then read CS Lewis “Until They Have Faces”, which is where the quotation at the end of your blog is from. Subsequently I was motivated to bring something to my priest in confession that had been a long source of shame that has long plagued me. I am conversing with a lifelong friend and amazed at spiritual “coincidences”!!! These are no coincidences. Gods Grace is abundant to all who “follow” His “narrow path”. Amazing how wide the “vistas”. All learning thru heavy doses of pain and suffering. Now I am reading Rod Dreher’s book “The Little Way of Ruthie Leming”, about his sisters cancer. AMAZING! Ah, there it is, the paradox through which we glimpse God — the thing the Byzantines held close for us all. Father, Michael, thank you for your response. It is a difficult thing to be thankful while experiencing shame and despair. May God give us each His grace. Does the fool “know” he or she is a fool in the eyes of the world? Is the foolishness a matter of choosing actions that would make one appear foolish or is the foolishness simply the consequence of living in faithfulness to the gospel in his or her unique relationship with God? Yes, I think the fool knows. Sometimes it is a deliberate choice on the part of the holy fools. We ourselves deliberately choosing to avoid looking foolish all the time – in order to avoid the shame of our existence. Living in faithfulness to the gospel is, forgive me, vague and problematic. Matthew the Poor once wrote that if we took any single commandment and pursued it relentlessly, it would open the Kingdom of God to us. I think relentlessly pursuing a single commandment will eventually land you in a great deal of foolishness. Then, there’s the need to actually bear it. I can easily imagine following the gospel in an arrogant and prideful manner. It’s why foolishness is often the better way. Besides, “faithfulness to the gospel” is the way of excellence. It is “getting it right.” Frankly, we’re not going to get it right most of the time. And that leads us to a cycle of striving and failing and pretty much having the same heart as our culture of success. What we need as foolish believers in Christ is to embrace the culture of failure. God will not save us through our success. He hasn’t come to save the righteous but sinners. This doesn’t mean that we don’t try to do right and keep the commandments. Only that our salvation will not come through that success, but through the humility and brokenness, the weakness of our failures. St. Paul was so righteous and excellent that God had to send him a demon to torment him – and this was for his salvation. The book is something new for me, and by annotations till now I have a great will to read it. Amazon stores offer it in English. I know the translation is probably wonderful but in original language is even better. Thank you for the peace of mind you all give to me with your comments! I’d say the foolishness is “the consequence of living in faithfulness to the gospel”. Surely such people are so taken up with God that they no longer watch themselves; they are no longer self-conscious. Perhaps they have seen the true foolishness of trying to construct an “Orthodox” persona that both gratifies their ego and impresses the world around them. The authentic fool for Christ is surely Love-struck. I really like what Gregory just said: the authentic fool for Christ is surely Love-struck. If you ask such people whether they know that they are fools in the eyes of the world, they may acknowledge that they are. But it is hard for me to consider that they even entertain such thoughts if they were not ask about it. I confess I get a bit confused because there seems to be a tendency to walk up and catch a glimpse of this essential point (our shame/foolishness based on our contingency) and then step back a bit (because of the heat?). This is a pastoral response on your part and Church correct? Yes. I think so. Holy Fools who are so lovestruck that they don’t see their own foolishness actually misses the entire point (both of Holy Fools and of the article – as well as the book). Holy Foolishness is a union with the shame that Christ Himself bears (the greatest holy fool of all is Christ on the Cross). Taking the sting out of it simply makes it merely incidental. No. The foolishness is very well known, and its shame is inescapable. They bear the shame for the sake of knowing Christ. It is a very, very difficult medicine. But it is important not to avoid it, even if we take but a drop at a time. Father, forgive me, I am really confused now. If I read correctly what you said above, it sounds as if I choose foolishness for the sake of knowing Christ. As if the source for it is in my choice. It may well be that I am missing the point (and I haven’t read the book). It seemed to me that I could not say no foolishness because of Christ’s love. It hurts, it is painful, at times I may want to give up, but the only thing that I truly know is Christ’s love. I wouldn’t say that it makes it incidental, but I cannot say either that I should pursue it, lest I am fooling myself. I just remembered something. I cannot give the correct text now, so I will cite from memory. Fr. Arsenie Boca (a Romanian priest considered a saint by many) once said that all the bad words we receive from the others are pearls in the Kingdom. To me, this sounds as if stinginess is not mere stinginess. Offering thanks is being already present in the kingdom; God who has not abandoned us. Perhaps I should listen to my mom’s advice: when you do not know, better be silent. But then I would no longer say a word :). Is then the Holy Fool an exemplar that, at it’s core, the Christian life, properly lived, is essentially or predominately the experiencing of, the dwelling on, the “sting” of his shame? Does he ever experience what Lewis called “joy”? Also, think of it in connection to today’s reading and the order of diligence-virtue-knowledge-self control-perseverance-godliness (which loops us back to “partakers of the divine nature). If you read this linearly (not very popular to a non-hierarchical modern exegesis) notice where “knowledge” is. We don’t really “know” Christ (that is impossible – this is the truth in the Platonic instinct that God is transcendent in such a way as to be unknowable). Partaking of Christ is at the end of a chain that includes knowledge, but comes through the whole chain and in this sense “choosing” (by a mental act) is not what really happens. I think I have an acute sensitivity to shame. In casual conversations, I’ll say one thing I think is foolish, and – even if there’s little or no reaction on the part of the other – that one thing will haunt me for days. In those moments when we experience the “tinge of shame,” what is the best reaction, or way of thinking? I’ve been trying to forgot about myself – to “die,” in part, and make the sign of the cross. What else would you advise? I did not mean to say that I believe that we choose foolishness. If it sounded this way, I expressed badly what I wanted to say, forgive me. I was merely wondering whether “choice” would not be the consequence of what Father stated above. After I wrote the comment, I thought some more, and I realized that I interpreted Father’s words wrongly. Forgive me, Father. As for the statement that we are nothing, I often say that we are nobodies. 🙂 But I also think that we are mighty nobodies, for Christ loves us, these nobodies, from the cross. I have the highest regard for the Russian novelist Evegeny Vodolazkin. I encourage readers to Read and listen to some of the interviews he has given and which are posted online. To summarize my understanding of Vodolzkin’s driving philosophy: He remarked that the Renaissance was actually the beginning of the end of true humanism, and that (despite its many traumatic events and challenges) the medieval period – especially in Russia – was far more humanistic. In both ages (Medieval and Renaissance) man is the measure of all things. But in the Renaissance, Man became the measure of all things – without reference to God. While in Medieval Russia the Man – Christ – was the measure of all things. He was the ultimate revelation of Man as created in the image of God, because He was both fully man and fully God. There is no true humanism outside of God; and only in relation to God, one can become fully human. He is a profound writer, and a true brother in Christ. Yes. I think you are right – we bear the shame or are willing to be foolish for the sake of knowing Christ. What I meant was related to the notion that those bearing shame or foolishness might not feel it because of their closeness with Christ. That, it would seem to me, makes the shame and foolishness beside the point. It’s like the concept of joyful sorrow. We cannot bear the sorrow without the joy, but the joy does not abolish the sorrow. It changes it in a mysterious way. When you’re alone, acknowledge the shame in the presence of God. And be aware of it (which is sort of painful). All the feelings of “haunting” (which is the shame), allow yourself to experience it, but staying in the presence of God. And then pray, “O God, comfort me!” This is how I was taught by Fr. Zacharias of Essex. That experience opens a kind of humility and allows for grace. Treat this as a person who has observed the Orthodox Church, but over the years has been unable to accept it in full, and as a result has trouble accepting God either, as a result. I wanted to say something in the previous article, I have never commented here before. But I assumed you are responding here now. Regarding Ecumenism it has become an obstacle to believing in the Orthodox Church. Not ecumenism of speaking, but ecumenism of praying. I would be able to support the ecumenism promoted today if they would stop doing joint prayers. Why is joint prayers such an obstacle? Again and again there are canons in ecumenical councils by holy fathers who say anyone who prays with a heretic require punishment. And anyone that would dare disobey the canons are anathema! I do not see this as a idle threat, if I am to believe in the Orthodox Church’s Symbol of Faith fully. Looking at examples, this is just one, there is a Metropolitan in Finland, who brought a Lutheran bishop (female) into the altar during liturgy. The Archbishop called foul and cited the canons, but the Ecumenical Patriarch only warned the Metropolitan, and did not enact the punishment that is called. And to this day the Metropolitan denies any wrongdoing, openly denying these canons apply to him, yet is still a canonical Metropolitan causing confusion to the Orthodox Church. It is clear what the Fathers of the Ecumenical Councils would say, and yet nothing happens. It is unlike today where when there is disagreement in the upcoming council they simply stop discussing issues, such as the calendar or how to deal with diaspora. Without a worldly authority, it can be argued the real issues do not get resolved at these councils. And so the upcoming council is not showing unity, as intended, but rather disunity. There is not even an attempt to heal the schism with the old calenderists, or any of the recent schisms. Not even a word. This fresh wound continues to bleed without treatment! Back to the point, when looking at the Orthodox Church I do not see consistency. I do not see the fathers of the councils as having the same MINDSET as those of today, at least not the majority. Instead, open disagreement. Even theologians today in universities openly talk of “post-patristic” theology, that the era of “patristic thought” has passed and now has “progressed”, to their delight. This can be troubling from certain points of view, because these are the ones educating the priesthood and bishops of the future. (Most bishops today are not actually from a monastic/ascetic educational background). Every time the issue of violations of canons is brought up, the response is either they are irrelevant to our times, or economia. Looking in the 70s we even have (then) Archimandrite Bartholomew writing of hope that the canons on prayer with heretics should be changed or amended because it is inconsistent with what had been occurring with Patriarch Athenegoras. I do not see the argument of economia on ignoring canons completely, economia as an excuse to go counter to the canons for years and years, it has gone beyond economia. If it was economia there would not be a prosecution and harsh criticism of those few canonical bishop who opposes joint prayers, as we see today. The argument of irrelevancy is a nonstarter, it is the same excuse that step by step lead the Anglicans further and further away, the same step that brought the Roman Catholic Church to the second vatican council. It may easily be used to change an organization to the opposite of its beginning. Ending this, I would like to hear a defense because you are a part of this Church. As I see it now, I should stop looking into the Orthodox Church as being any different from the Roman Catholics, who move with the wind of time and have very little consistency, who looking in the past do not see anything to emulate, but rather to progress past, in order to prevent a supposed “walling in” of the Church, afraid without innovation the Church will disappear into “irrelevancy”, or so the innovators claim. I cannot see myself saying the Catholic Church will teach the same beliefs a thousand years in the future as it taught a thousand years into the past. I question if I can say it about the Orthodox Church. I understand I have no right to question the Church in these matters, if she is truly the Bride of Christ. But without an answer regarding these issues I cannot believe it, to my fault. Well, there are good reasons for not praying with heretics as the canons indicate. The treatment of RC’s in a different manner, is, apparently, a judgment that they are not heretics in the formal sense but are simply in schism. It’s a fine distinction, but a generosity I’m willing to tolerate. In general, I do not participate in various ecumenical events, with the exception of Pro-Life marches – where I certainly say “Amen” to someone’s prayer when it seems correct. But I think that there may be issues in your heart to be dealt with. You hesitate to become Orthodox because the Orthodox are not Orthodox enough for you. Myself, I do not think we are sailing down an ecumenical river, though I see some few who would like to. I am certain that if a bishop(s) truly fall into ecumenism (as in inter-communion), there will be a major schism within Orthodoxy – because this is not the mind of the Church. I pray that this never happens. I suspect that if you were a truly good student of history, you would see that life within the true Church has always been a lot messier than you seem willing to tolerate. The messiness has not destroyed the Church. Some, however, have fallen into error and schism on account of a conscience that is too fastidious. The heart is a difficult thing – first to find – and second to remain within. I pray God gives you grace to find it. What is “vast and obvious” is her secular mind and the distance between her philosophy (a rather mundane modern “scientism” and pyschological account of man) and anything resembling a Christian understanding of man. This is damn-you-to-hell stuff, and I will be asking my bishop when I see him next weekend what fool or group of fools decided to put her on the “Metropoliton council” and what is the character of his foolishness for tolerating it and listening to her. Sure, my language will be “measured” but I assure you my meaning will be clear. Perhaps I tick him off and I will be excommunicated. The rascally part of me hopes so as it would be alot easier to be “Orthodox” and not have to be in communion with fools like these. Or would it? What is the nature of the “foolishness” of the Church? If we dogmatically accept the “foolishness” of Christ and His Cross, what are we to make of the continued foolishness of the world (and its want, suffer, and death) and the fact that the Church is up to it’s neck in the world and is full of fools like us? Is not ALL “economia” a foolish attempt to make some good out of failure? Since it is ALL economia (“for Lord, if You should mark inequities who could stand”), there is nothing but failure and foolish economia. As to whose “fault” these obvious failures that you and I point to, well this “fault” is in our own hearts as well and any fool can see this. What sort of fool are you, to stand outside the Church when you know the Grace that is within – a Grace that “tolerates” all sorts of fools? Christopher, members of the Met. Council are elected, not appointed. They are elected by the Diocesan assembly. Also one from each diocese is elected by the All American Council. Thus, I would assume she’s elected for some reason – but not because of her heterodox and unscientific views on human life. Any number of priests on the Met. Council, whom I know, would surely rebuke such a statement. Thanks for the clarification Father but I (and she) are not in your jurisdiction just to be clear. I am not naming names simply to stay withing the guidelines of the blog and for the fact that it is not really relevant in that in my experience such a situations are common to all jurisdictions in one form or another. We live in America and the culture permeates everything. I’ve encountered Orthodoxy with varying opinions that are less than Orthodox, particularly if those opinions a driven by a political commitment. I’ve noticed that most people in America are political before they are religious. They find ways to reconcile their religion with their politics. It is disturbing in the extreme. But not unusual. Thank you for the challenge regarding my use of the phrase “faithfulness to the gospel.” I am still learning the vocabulary (and meanings) that is (are) in sync. with the Holy Tradition. I am blessed by your challenge and clarification. Forgive me but buying books on season when there is a marvelous Orthodox source: Eighth Day Books is a bad choice. Amazon does not support anything Christian. Why give your money to the enemy? I listen to Sister Vassa’s podcasts. She also refuses to be dragged into the quagmire of church politics. Instead, her focus is on the Church and it’s daily life and our walk within it. I cannot read the sites which promote discussions on church politics. Many of the comments are negative and very polemical. They drag me down. That’s also why I’ve had to cease listening to conservative radio. I just find myself getting angry and there is nothing I can do about what I hear (or imagine). Besides, as you’ve written before, most have an agenda to keep people angry and in foment so they can stay in business. They fracture my focus and keep me from doing the one thing needful. Lord have mercy. Keep on writing if only for this fool’s sake! I read this book a couple of weeks ago, while under 1:1 observation in the psych ward of my local hospital – a place I feared to go – after getting bumped out of a more comfortable alternative hospital due to a last-minute insurance snafu. I had the added strangeness of being unexpectedly locked up with a fragile former student of mine, trapped in a pressure cooker where I could not figure out how to be as vulnerable as I thought I needed to be while still being the “teacher” both of us wanted me to be. It was like shoving a mirror directly up to the crazy-making question of how to integrate my public face with a vulnerability I don’t properly know how to inhabit. Ironically, I had pursued hospitalization in the first place so that I could “be vulnerable.” How terrifying when this decision led to the loss of so much control. In light of this, Laurus was a good read. Kudos to the the catechumen friend who passed it on to me. What struck me was that Arseny’s path was necessary. Everything he did after Ustina’s death was what HAD to be done. With historically overmanaged chaos now running wild in my own life, Arseny’s story leads me to wonder how to know when the choices I make are similarly necessary. Arseny had a focus: he loved Ustina. Me? I don’t properly feel the things that I love. How do I find the focus to know what to live for? Every choice seems insane. How do I know what to do? I can only say pray. If you have a spiritual father or sponsor, speak with them often. It is good to be needful in some things but we need others around us who can help bear these burdens. I will pray for you. Please also pray for me. Do you think the shame experienced by someone who is part of a 12 step program could be considered some “drops of the medicine of shame” that you speak of? I admire your constant, overt and shameless promotion of Eighth Day Books. My last book purchase was made from them because of you – not because of them; I know nothing of them. And shipping up to Canada wasn’t cheap. But you earned it. Thanks for caring for something besides yourself. My father confessor recently helped me re-do my prayer rule, and is having me include some “O Most Holy Theotokos, save us” and the lingering Protestantism in my soul shrinks back a little from such a prayer, or at least is confounded by it. I remember the article I am describing really helped me understand it better, but it was months ago that I read it. Forgive me Father, but I wish to second Michael’s encouragement to all of use to purchase books from Eighth Day Books. This is a wonderful little store, owned by a deeply devout Orthodox man. This store is an Orthodox treasure and by purchasing books from them, we’re helping to ensure that it remains open. Some of the books I’ve purchased from them were a buck or two more they were on Amazon, but for me, it’s more than worth it. Some cost the same as they do on Amazon. Also, if you have any questions about a book, or need a recommendation, just email them, and you’ll get a response in short time. They truly provide wonderful service. Trust me on this, the owner really runs this as a ministry, and is fortunate if he manages to squeak out a small profit. Anyone who knows anything about the book business will know this to be true. Finally, no, I am not affiliated in any way with the bookstore, just a highly satisfied customer who loves this ministry / store. Larchet, Jean-Claude; Champoux, G. John; Coomaraswamy, Rama P.
Sunny, you can also try searching an online Bible just using the word “save.” I use Biblegateway.com, and there’s no charge. You can confine your search to the NT and just look at all the ways the word is used there. I do remember helpful discussion on that issue at this site, but some of it could have taken place in comments as well. drewster2000, I am sure that Warren, the 8th Day owner, is appreciative. I care about 8th Day because Warren is my friend but mostly because it is the best bookstore I have ever been in in my life. It is all about love: love of learning, love of good books, love of God–all of the things Amazon is not. I was fortunate to be there the last time Met. Kallistos came. He was like a little child in a candy store. He bought many books and had them shipped back to England (talk about shipping costs) because he could not find the books there. It is a place of peace and blessing and holy memories. A friend of mine from central Minnesota made it a special stop on her way to Arizona because she could. She was literally just passing through, but she had to stop. I took some time and met her and her English friend there. In the process I was able to alert her English friend of some of the Orthodox work going on in England. It is a place of connections. The second floor is dedicated to history, philosophy and the arts. The largely vertical trek to the third floor gets you to Warren’s office. The store is a place of wonder and deep humanity. Good music is often playing and there is always a large carafe of fine coffee. There is a chair facing the check-out counter which is an honor and a blessing to sit in that is redolent with memories of friends who have sat there in the past. It is a gathering place for all who care about others and about life. There are times when people go there just to sit in that chair for awhile. BTW: Warren has a traveling version of the store that he takes on the road for various events. I know he has traveled close to 1000 miles each way. So if your parish is within a 1000 miles of Wichita, KS and you are having an event that would be enhanced with good books and a knowledgeable host, you can always invite him. He will tailor the selection of books to your event as much as he can if he can fit it into his schedule. We will not always have Eighth Day, we should make use of such a unique blessing while we can. So true. As a shy and timid person myself, reading the lives of the holy fools is a balm and joy to my soul. They are the bravest people. I think we’re mistaken if we believe that shame is some sort of good in itself, though. (I don’t think Fr. Stephen that you are saying this at all.) I say so because it’s important that we remember what witnessing is. Martyrdom is also a kind of a shame, just as hanging on a Cross was. But the one who bears the same as martyr is just that: a witness. It’s not the shame that is intrinsically of value, it’s what one bears the shame for. Another paradox. We can’t forget the apocalyptic (if you will) nature of the reality of what we are a part of, the cosmic picture of the fool. Shame is by no means an inherent good. Self-emptying is, however. Bearing shame is a major means of self-emptying. Shame is an experience, not a thing in itself, exactly. It is, as I’ve noted, a feeling or experience that frequently, or normally, accompanies the reality of our true self in the presence of God. And then He covers us. Acknowledging the shame is inherently good. I was not aware of Eighth Day Books. I will check them out. Thanks Michael for pointing this out to me. One may not sin out of fear. This is an inferior level, but it still is good. Or out of love: just like the saints or people with superior characters. But also out of shame. A terrible shame, similar to doing an indecent thing before a delicate person, saying an ugly word before an old woman, or betraying someone who trusts you. After you have encountered Christ, you find it hard to sin because you are terribly ashamed. Laurus is wonderful! Had you not mentioned it in this post . . . I would have missed it. It is a gem and spoke directly to me. I must find my own path of foolishness. I gave my copy to a friend so he could experience Laurus’ path and see him dragged into the woods to be left for the animals. So now I must go forth and buy another . . . from Eighth Day Books of course. Well, I did buy another copy of Laurus to have on hand to give away. Tonight a young man and his wife spoke in our city about the Orthodox Church in Syria and the persecution Christians are enduring there. Knowing that the book is relatively new, I took a chance that they did not yet have a copy and took it as a gift for them. (The young man had studied church history and found Orthodoxy . . . he then traveled to see for himself the historical places where Orthodoxy had its roots and ended up meeting the young Syrian woman who became his wife.) The presentation was great. I stuck around till most everyone had left and approached with the gift. He recognized it right away and was quite happy to receive it, as he and his wife did not yet have a copy. He commented that his priest had given copies to some in his parish. I have given many gifts in my life, but rarely have I received so much satisfaction in giving a gift. Now I have to go and order another copy of Laurus . . . I can’t wait to give it away!